“It was an incredible experience,” the Samford School of the Arts dean said of his six weeks as a Fulbright Senior Specialist and residence artist at Universitas Pelita Harapan’s (UPH) Conservatory of Music near Jakarta, Indonesia. In a project that he helped design as part of the competitive Fulbright Senior Specialists application process, Hopkins led students in music theatre and opera workshops, choir clinics and voice masterclasses. He also worked with conservatory faculty and administrators, and engaged in church and community music programs. Hopkins found his work with students in music theatre workshops to be particularly rewarding. “They learned about singing while acting and acting while singing,” said Hopkins, noting that “Wicked” was the only one of the works the students were familiar with prior to the class. The dean of Samford’s multi-faceted arts program discussed curriculum and program design with faculty and administrators at the conservatory, which he says has a well-established program with 300 majors. 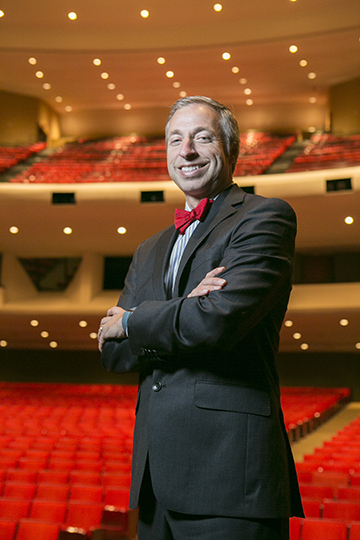 “The leadership at UPH understands the power of the arts in education,” Hopkins said, adding that UPH had been contemplating introducing musical theatre to the curriculum prior to his visit. He now feels they will take the next steps to make it a reality. While UPH, which enrolls 11,000 students, and Samford are both faith-based Christian universities, differences are hard to miss, said Hopkins. “The background is the real difference. The institutions have similar Christian missions, but one is a in a largely Christian nation while the other nation is 90 percent Muslim,” said Hopkins, who had visited Indonesia two years ago with Samford President Andrew Westmoreland. “To speak of Christian faith in Indonesia requires conviction and courage. We were stirred by the zeal of our new friends, and we could see Christ changing their nation,” said Hopkins, who feels strongly that artists can change the world through messages conveyed through their art. For that reason, he believes, Christian artists must strive to be the best, and universities must seek to prepare these young talents. “The remarkable efforts of devoted leaders, teachers and servants are transforming a nation in the name of Christ. I could see the power of Christian higher education and how it’s changing the world there. It was our privilege to be a part of this movement for a short time,” Hopkins said. He was accompanied to Indonesia by his wife, Suzanne, and their two sons, Joseph, 11, and Vance, 9, who attended local schools in the suburbs of Jakarta, the world’s second largest city. Hopkins said the family, who lived on the 30th floor of a high rise apartment building, found their new Indonesian friends to be helpful and gracious. During the last two days of his stay, Hopkins both gave and received musically. One evening, his students performed scenes from their class in his honor. Another night, he and Suzanne performed a duet recital accompanied by the choirs and members of the faculty in a special concert to show appreciation to their hosts.